Location: Vignevieille, in the Aude departement of France (Languedoc-Roussillon Region). 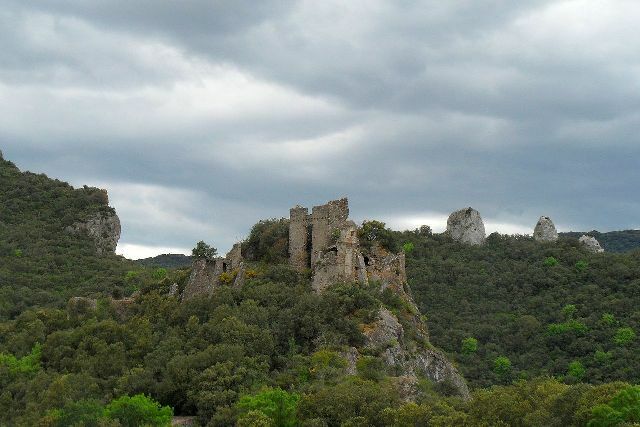 Notes: Château de Durfort is one of the Cathar castles of the Aude, near Vignevieille.There remains no written record of the initial construction of this fort. Around one thousand in France, the fortified settlements evolve simple wooden towers identified palisades (motte), to more resistant masonry structures (castle). Durfort is built on a mass of rock overlooking the gorges of the Orbieu, offering a good view of the valley. The first medieval forts were first lookout positions, housing small garrisons of local lords, ensuring control of agricultural valleys and trade routes on which they levied rights of way. Durfort is located on a peak, surrounded on 3 sides by a bend in the river Orbieu, making it a good defensive position. The first written records mentioning the fort of Durfort date from the eleventh century. In 1093, it is mentioned in a transaction between the son of the lord of Durfort, Bertrand, and the Abbey of Lagrasse. In 1124, William and Raymond, lords of Durfort, pay homage to Viscount Bernard Aton of Carcassonne, and in 1163, the term Lord honors the Viscount Raymond Trencavel, for the castle of Durfort.